The End of Wisdom? The Future of Libraries in a Digital Age assembles opinion pieces, forecasts, strategy options, and case studies from leading worldwide politicians, academics, educators, authors, publishers, captains of industry, senior public sector workers, library directors, IT gurus and other key players in the field of information provision who discuss their views on the hypothesis surrounding the "end of libraries" and the "death of books." 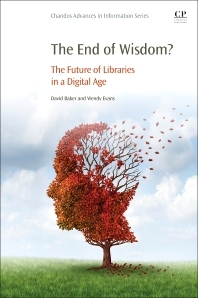 The contributions – ranging in length from 500 to 2000 words are analyzed and summarized to create a rich picture of current trends and likely futures for libraries of all types, with digital options discussed in detail. 7. Tibor Koltay - Library 2.0: Lost illusions? 11. Evgenia Vassilakaki - New trends in higher education: can information professionals rise to the challenge? 23. Karen Carden - Not only but also? Wendy Evans is the Head of Library at the University of St. Mark and St John, UK. She has published and lectured in the field of electronic journal and database usage, access versus ownership of journals, and has already co-edited and co-authored four books with David Baker.